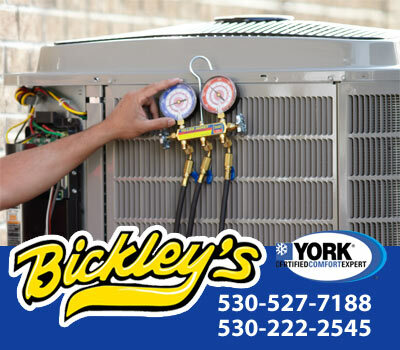 Bickley's provides fast, reliable air conditioning repair in Red Bluff, CA that will help you take the edge off of the summer heat. Bickley's air conditioning technicians can diagnose and repair any type of air conditioning system - any make, and any model. 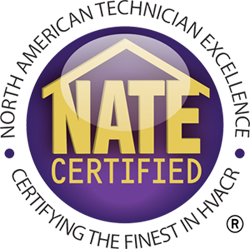 We not only repair air conditioning systems in Red Bluff, CA, we also provide preventative maintenance that will prolong the life of your air conditioner, improve its performance and help it run more efficiently and economically. Our air conditioning professionals can also help you replace your existing air conditioning system with a new energy-efficient air conditioning system that will be provide superior cooling and comfort and save your money. 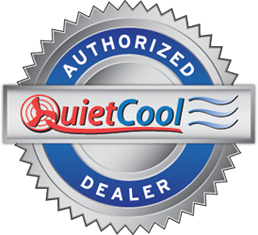 Our knowledge of air conditioning systems and equipment is unmatched. We service both contemporary and traditional styled homes. We service air conditioning systems in a wide range of sizes, so no matter how big or small your system or home is, Bickley's can help you get and stay cool. Whatever your air conditioning needs, we are confident that our skilled air conditioning technicians will be able to get your air conditioner functioning properly again! If your air conditioner unit is more than 10 years old, it is probably running at less than 60% energy efficiency resulting in less cooling to your home. This may seem little at first, but when you tally it up you will see just how much of your money is being wasted. Over the years, we have helped our customers save money by replacing and installing new air conditioning in Red Bluff, CA. Let us help you reduce your cooling cost by a free estimate for AC replacement. Over a short amount of time, a new air conditioning replacement will pay for itself! We hadn't had our a/c serviced for several years so we called another company (big mistake); they quoted us about 5k for duct work, etc. Then a friend suggested Bickley's and a nice young man came out and checked everything out. We needed a part in the a/c unit -- paid $100 and we were up and running. What a difference the part made. Mary, in the office, is courteous and called us back regarding our appointment. We have many friends who also praise their work. We also had them out for an estimate on a whole-house fan. Very professional and courteous. Request AC Repair in Redding, CA.